Listen to "Disaster Preparedness: A Memoir" on your iOS and Android device. This is a stunningly perceptive, hilarious memoir of the transformative humiliation of childhood&apos;and adulthood&apos;from a truly original, already beloved voice. 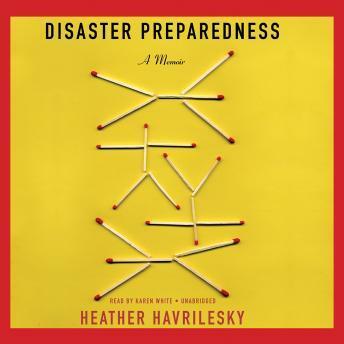 A brave and hilarious memoir, Disaster Preparedness charts how the most painful moments in Havrilesky&apos;s life prepared her for a cautious but honest adulthood. From her na&apos;ve take on her parents&apos; D-I-V-O-R-C-E, to losing her virginity in less than ideal circumstances, to losing her father way before she was ready, in chapter after chapter Havrilesky peels back the layers of her childhood innocence and reveals the wounds that have shaped her, the lessons that have&apos;despite her thickheadedness&apos;managed to sink in, and the laughter that has carried her through.By laying bare her bumps and bruises, Havrilesky offers hope that anyone can create a frazzled and unruly, desperate and wistful, fabulously frayed-at-the-edges plan to stare disaster in the face, to meet it head-on. Uproarious, sophisticated, and wise, Disaster Preparedness is a field guide to personal disasters from an irresistible voice that gets to the heart of it all.